Rasam is a South Indian soup. It is prepared with tamarind juice or tomato, pepper and other spices. A typical South Indian meal will never be complete without rasam. Rasam can be taken as a soup or as an accompaniment for rice. It is very simple to prepare rasam and it comes under comfort food. This is very common in my house and I love it with hot steamed rice and any curry. Today let us learn how to make Jeera rasam following this easy recipe. These tomatoes are terrified and are sweating (I took it out from the fridge) as they are going to be cooked in the same manner tomorrow. Soak tamarind in 1 1/2 cup of warm water for 10 minutes and extract its juice. Discard the pulp. Soak the ingredients given under "for grinding" in a little warm water for 15 minutes and grind it coarsely. Keep it aside. Take tamarind extract, add salt, chopped tomatoes, sambar powder and curry leaves. Boil on low flame until it is reduced and the raw flavor of the tamarind goes. Always rasam should be boiled on low flame/heat. Then add the ground paste along with appoximately 1 1/2 cup of water. When froth starts forming on the surface, switch off the flame. Do not boil it. Heat a tsp of ghee, add mustard, jeera seeds, when it sizzles, add curry leaves and pour the seasoning over the rasam. Serve hot with hot steamed rice and any vegetable curry, it is simply divine. Looks tangy and spicy rasam..Loved the 2 cute tomatoes..
wooow.. looks perfect & Yummy..
My all time comfort dish.Yours is perfect for a gloomy day here. cute tomatoes!!! so creative deary!!! Wow ...Gr8 asusal ...excellent click ...and loved the way u presented it ...we will wait for next dish with tomato ..
Jeera rasam is tempting with cute pic...I love ur neat presentation. Jeera rasam and terrifed tomatoes looks really good. I believe that jeera rasam facilitates in digestion very much.Thanks for sharing the recipe.I like to have it with potato fry n rice. Lovely presentation loved those blinking tomatoes with rasam. Nice recipe and lovely presentation. I never tried adding sambar powder in rasam. Jeera rasam, my all time favourite...lovely and cute presentation.. I am thrilled to learn about your cuisine and this rasam sounds delicious and easy to make! heh heh, loved the sweating tomatoes :) jeera rasam looks delicious. Nice Rasam..my all time fav! I like this rasam very much.Must give it a try. Super click. Nice pot. I love rasam too. hey this looks so cute...love the presentation,and the jeera rasam too..feel like having a bowl of it now..slurrp..
Padhu,,rasam looks perfect n i like it very much with any veg or non veg curry,,, good for digestion after a heavy meal....jeera rasam is very good to taste n also for health,,very light meal..
love the jeera rasam, padhu...you have awesome talent for presentation and a good sense of humor, my friend. Hi Padu, this is my first visit to your blog. Rasam is my all time fav. 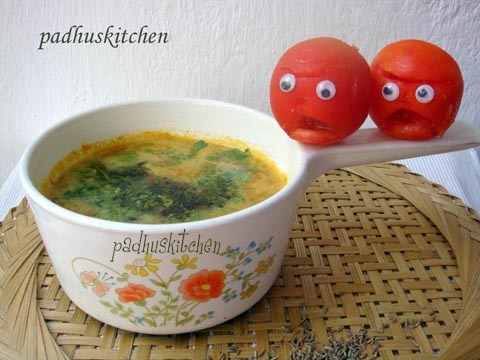 Love it...Visit my blog also..
Never cooked rasam at home. Lovely presentation. Lovely rasam recipe...will try it for sure. jeera rassam looks delicious, I love it!!! This is a comforting food for me especially during the rainy days..
Hey Padhu...love these tomatoes with their googly eyes. Ur a queen of vegetable/fruit carving. I love jeera rasam or for that matter any rasam with hot rice. Its simply awesome. I just posted carrot and honey milkshake and I was inspired by you to try my hand at making Mr. Carrot with the googly eyes..do check it out and I mentioned YOU on my blog. Rasam looks spicy and yummy. I liked the tomatoes very much. Wonderful presentation. Lovely rasam, comfort one...looks delicious. LOL at those terrified tomatoes! Absolute comfort food this...love to sip this rasam on a rainy, cloudy day. You are fabulous with presentation! Jeera rasam looks very good. Good job! I think rasam is an excellent dish!Spicy delicious yet a light soup one can enjoy in summer time! Those tomatoes are really cute but I am wondering why they look a bit angry?? hahaha! hi..waiting for ur next tomato dish...there are some awards waiting for u in my blog dear..pls collect them ..i really think u deserve them.. I tried your Jeera Rasam and posted it under tried and tasted in my blog.Thank you very much for sharing this delicious and healthy rasam with us. Wow love your presentation ,looks yummy! Thanks for visiting my blog.Love your blog ,following you. Superb recipe; I tried this thrice and my hubby and parents loved it! Thanks to you! Hi great recipe! Can you tell me the brand of this ceramic bowl please? thank you so much! I tried your rasam.. It came out very well.. Thank you so much!